A few years back, I heard that a company I was unfamiliar with was launching a playtest and a Kickstarter for a brand new Conan roleplaying game. I was actually pretty excited. 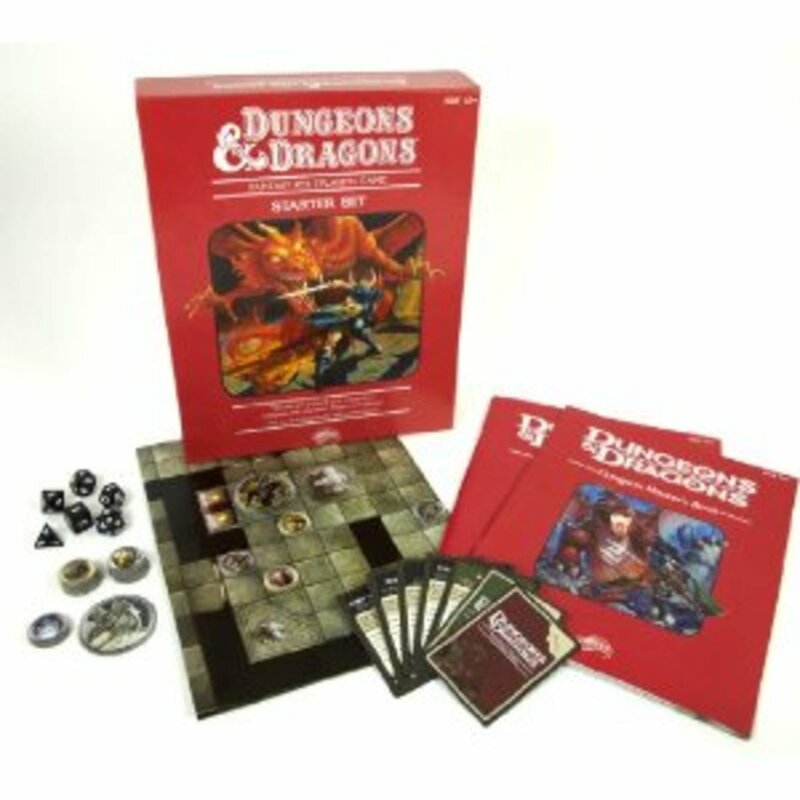 I grew up playing Dungeons & Dragons and similar RPGs and I was looking forward to yet another iteration of a fantasy roleplaying game. One of the developers even got me in on the beta test after the call for beta testers had closed. At first blush, everything this team was doing made it look like this game was going to be epic. The past few years have thrown a lot of things my way. I didn't get to dive into this game wholeheartedly like I wanted to. First, it turns out my typical gaming group of the time really had no interest in the game. Those people I did find who were interested in testing on the new game's rules were already in full groups or overseas and the time difference prohibited me from finding time to join in. I had these playtest documents, but I had never played the 2d20 system by Modiphius, so it was a dry read--as playtest documents tend to be--without a way of putting the system to the test. So, I got some brief glimpses, but I didn't get to immerse myself in the game. Fast forward a few years and it's February 2018. I have seen the finished product come out, but it's not inexpensive. I hear it is a fun game and a beautiful book, but I don't see any copies of it locally. I am loathe to buy a book without getting to examine and flip through it. This is especially true for gaming books. I finally managed to peak at a friends and read some reviews and decided to make the plunge and buy the core book for Conan Adventures in an Age Undreamed Of from Modiphius. And, I am very happy I did. So, I finally got my book--first a PDF. As a friendly warning, do NOT trying printing out a copy on an inkjet you're responsible for purchasing the ink on. It's a beautiful full color book and by all accounts, the dead tree version is wellbound and definitely worth it. I have one on the way and hope to update this article once it comes in. Reviewing the book itself, I found the mechanic interesting. It uses d20, but it is not the d20 system or any variation thereof, really. It is an attribute + skill based gameplay, where you roll a number of d20--usually two, unless you spend in game currency to get more--and are trying to roll under the sum of a character's Skill + Attribute for most tasks in the game. Six-sided dice are used for damage and can fire off special attacks in the game. I found it interesting how they did the d6, too--1 and 2 equal 1 and 2, 3 and 4 have no value, 5 and 6 each equal one plus an effect. I mention in game currency and there are three--Fortune and Momentum are both used by players while the GM uses something called a Doom pool. We'll talk about those later. It might seem like those would impede or complicate the game, but they really don't. This RPG is definitely set up to run grueling and awesome combat scenes. Just the same, the rules easily support and encourage other types of play including social and political intrigue, investigation, exploration, a bit or horror, and more. Reading this book is a bit of an undertaking, coming in at a good clip over 400 pages and bringing a fair bit of rules and flavor. 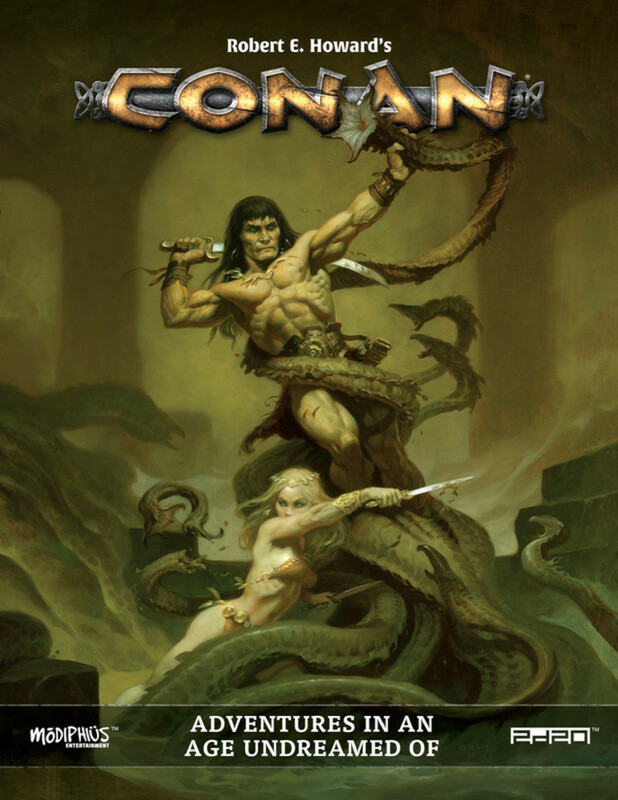 So, here's a little known fact: I was almost named Conan--yup, after the very barbarian this roleplaying game is based. My mother told me I dodged a bullet that day, but growing up mostly in the 80s and 90s (although my wife would tell you I still haven't), the name Cameron wasn't winning me an popularity contests. My father is a voracious reader and some of his favorite stories/books were of Conan, the Barbarian. He made sure I watched the Conan and Red Sonja movies when I was younger. As a bit of nostalgia, I made sure I watched the most recent with Jason Mamoa. My father was also one heck of a critic. For years, I've have been thinking I should go back and read the Conan series. If he likes them so much, they must be good. Yet, I have never made the time. Admittedly, I am not as well read as I wish I were or even as I should be. Yet, I have read a bit about Conan over the years and I understood how and what the Hyborian Age is. Reading excerpts of Howard's writing in this game book has me now reading those old stories and I am loving them. 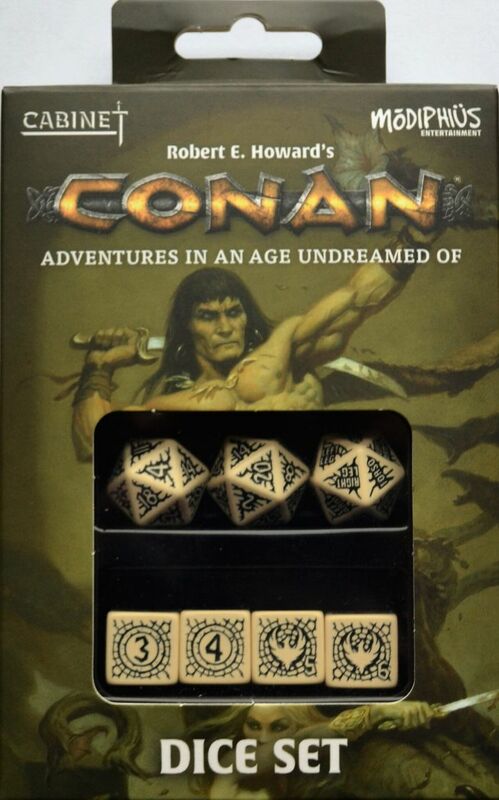 One of the last straws when it came to getting me into Conan Adventures in an Age Undreamed Of was this brilliant game review over at RPGKnights. And, I love me a good RPG game review. The guy who does RPGKnights is actually a friend and I do respect his opinion. It also happened we get a chance to talk about a week after he published this and, within a few short minutes--less than 20, I was able to roll up my first Modiphius character: Daveed. 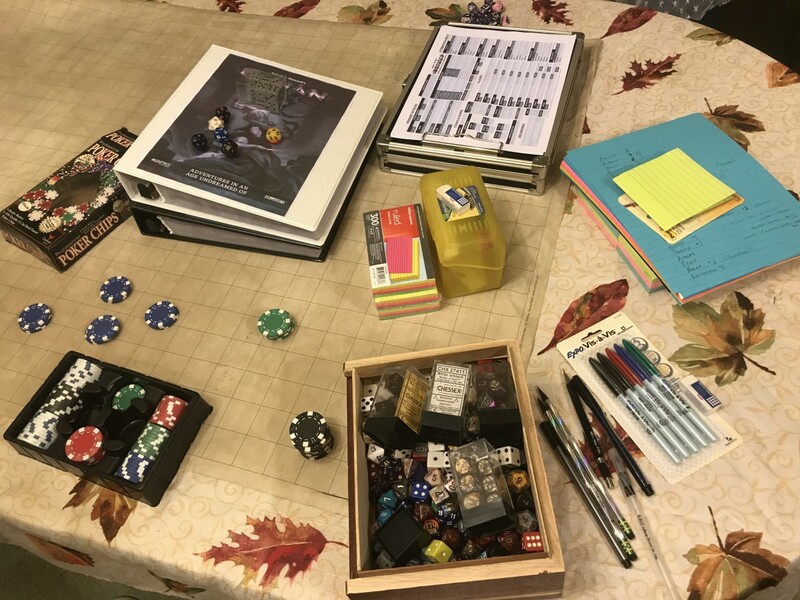 Like a lot of things, when it comes to roleplaying games, you can read it, but full understanding doesn't really sink in until you have experienced it. When I read over the character creation portion of this book, I was intrigued. It looked smart, but I wasn't quite sure how it would pan out. The game is designed for people to randomly roll to generate their characters. This is okay, but my past experience with other games has shown me that randomly generated characters can lead to some pretty wonky results--weird, unbalanced, and even virtually unplayable characters. Other times, it works out just fine. With Mark Knights on the line, I was able to run through creating Daveed. I didn't start with the name, by the way. In fact, I didn't start with anything. Normally, when sitting down to create my first character for a new tabletop game, I have an idea of what it is I want to play. In the case of fantasy, such as this...more or less, I might want to play a barbarian, paladin, although rangers and thieves happen to be two of my favorites. This time, however, I had no preconceived notions of leanings. I was going to try this random generation and see how it worked out. Homeland: I make a quick roll and find out my character is from Zamora. As I mentioned previously, I only have passing familiarity with the Hyborian legends; so, I look at the book. 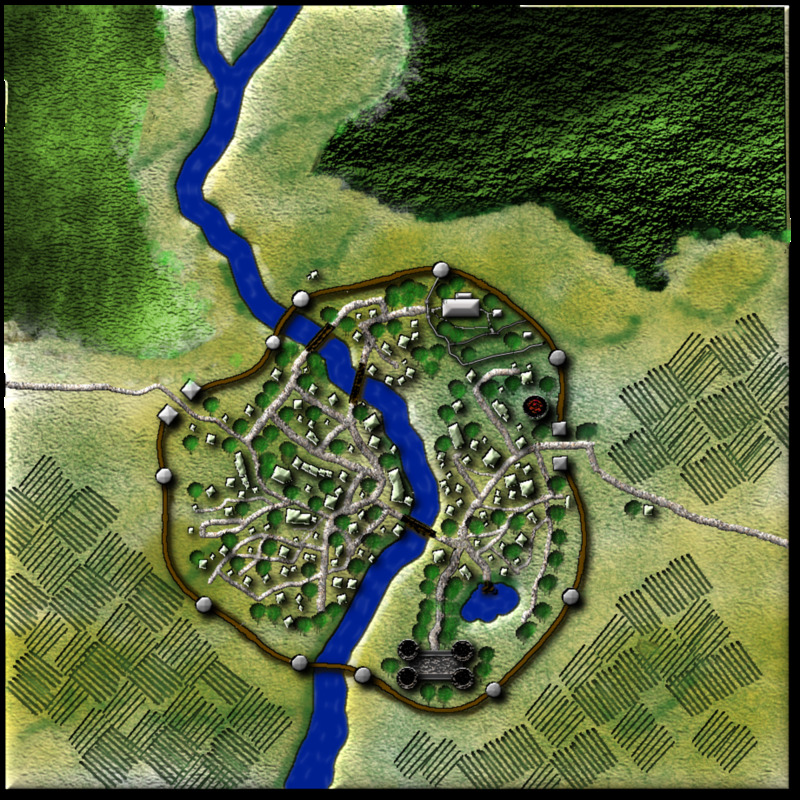 Zamora is basically a decaying city-state of thieves and I get my first talent and language: Zamorian and Honest Corruption. I mark those down then move on. City of Thieves, eh? Is the game going to help me build a thief right off the bat? Does it know what I like? Attributes: Again, I need to roll. This isn't the typical attribute rolling method I am used to. I roll for two categories to tell me something about my character and then I need to make some decisions, allocating points. I ended up rolling Eagle-Eyed and Dexterous, which give me the mandatory attributes of Awareness, Coordination, Agility, and Coordination--two selections for Coordination, cool. 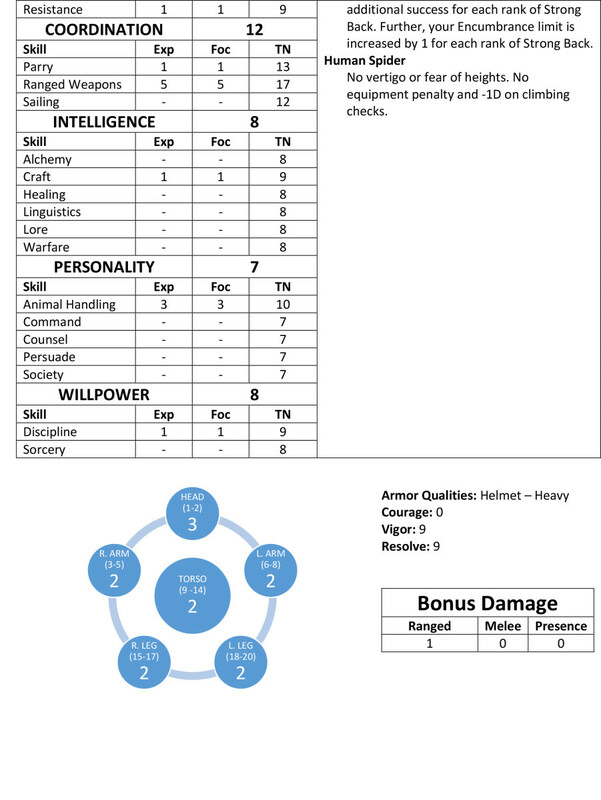 This roll also gave me the optional attributes of Intelligence, Personality, Brawn, and Willpower. (Sorry, folks, you'll need to get your own copy of the book to know exactly how that works out). I assign my points and continue on my journey. This is certainly beginning to look a lot like a thief to me. Caste: I make this roll and end up with farmer. Luckily, I don't immediately get the plague and die. I never generally wouldn't have gone there. I would think thief--city dweller, street urchin, maybe and orphan. But, I could see this too. Maybe a country bumpkin made his way by good or misfortune to the big city and ends up turning to a life of crime. Story: I now have to roll for a story related directly to the character's Caste. I get Blessed Harvests, which indicates a happy home life. Where are they now? What are they doing? My character now has the Family trait. Hmmm, what kind of thief is this? One with a happy family that he misses dearly? This is turning out to be an interesting character and the statistics are taking a backseat as I am mulling over how the story works together. Archetype: Okay, this is familiar. The archetype is kind of like a class or profession from other systems. It just gives you the beginnings, though, no long tables based on abilities as a character grows in experience. I roll the dice. Come on, thief! Mercenary. Well, that's close. 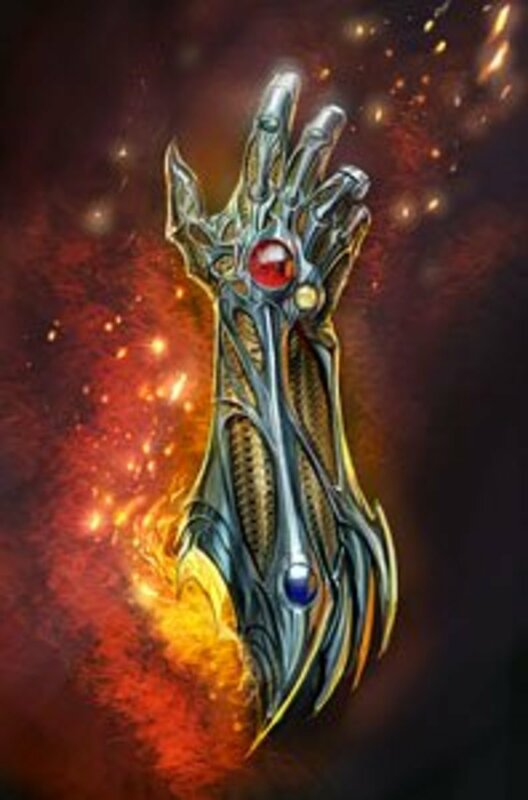 I mark down the skills and talent I receive along with the gear granted by the archetype. Nature: Now, I am rolling for the character's attitude and outlook. So many of us in roleplaying find our sweet spot and play the same character again and again. They may or may not be different classes with different abilities, but their behaviors and mannerisms are the same. I think it's a great touch that they made this random. In this case, I end up with Wrathful. This character is going to have a harsh way about them--not surprising for one who has lived the life of a sell-sword. These means some additional skills and a talent. I mark those down. Education: Next, I roll up how the character was educated. I end up with Traditional. This seems odd to me considering we already have a thieving farmer merc. I can make this work. I write down the skills and talent option. I get to choose from some gear too, but am not sure what I'll end up taking yet, so I write down my choices as well. War Story: Turns out my character survived a massacre. This is pretty standard fare for a fantasy RPG, particularly sword and sorcery. It also grants some skills. I think this great. A lot of gamers add and choose skills and abilities for their characters based on what they want them to be good at; they fail to think of how or why they picked those skills up. This encourages reasoning why your character is what they are, why they can do what they do. Mental note: Come up with a good story for the massacre--probably the last survivor of his mercenary company. Options: I get some points to spend toward skills and attributes now. I make a mistake at first, just quickly reading the bullet points and marking choices down. No, choose ONE of those options, not all of them. That's why I always have a rough draft and an eraser during character creation. Complete my choices and go on to the next section. Finishing Touches: I have some basic math to do to figure things like Vigor, Resolve, and Gold. I also go through and complete the choices for gear I was given during early stages of character creation. 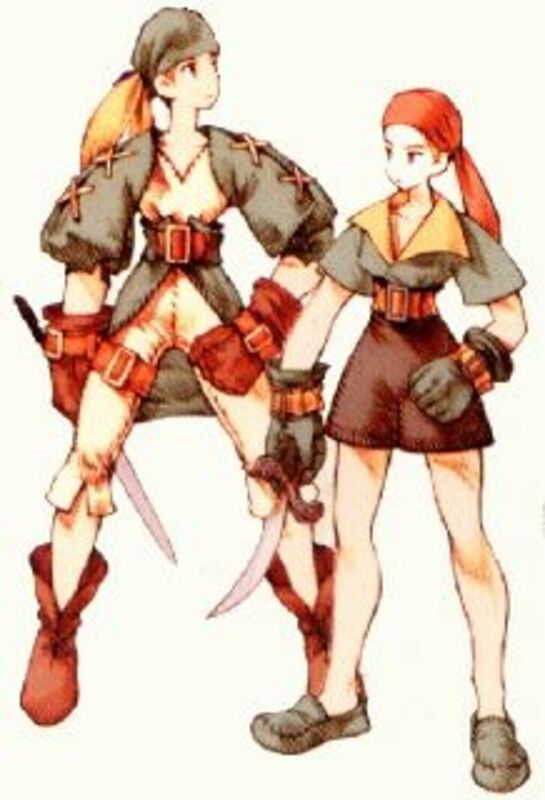 There is a joke made because the character ends up being at max skill expertise and focus with Ranged Weapons, a high Coordination, and a sling from their archetype. "You should be sure to name him David," Mark jokes making a David and Goliath story. Great, he has a name. I fill in the character sheet and come up with a background. Daveed's Background: Daveed was a boy raised on a small farm on the outskirts of Zamora. His family worked hard and loved one another dearly. One day, Daveed was sent to town to sell some of the season's harvest. He went on his own, stayed the night, made his sale, and returned. Approaching his farm, he could see the sickly black smoke. The farm and crops had been raised. His family--father, mother, younger sister--were missing. He had expected to find their bodies, but there were none there and he couldn't pick up a trail to determine where they had gone. Broken and defeated, Daveed returned to the city to figure out what to do. There, he came across a lieutenant for the fabled Black Company--a band of mercenaries feared far and wide. He ended up joining their ranks. The Black Company was known for being ruthless and effective, but part of that was because they required their recruits to be smart, capable, and educated. They paid for his school and Daveed ended up training in his spare hours. He was lithe and agile and ended up becoming one of the Black Company Crows, the mercenary company's renowned archers. It was at the battle of Black Fall where Daveed was one of the few survivors. Their force was overcome by barbarians from the north. Daveed was no free to find out what really happened to his family. He has seen too much death and suffered too much loss at a young age and it has made him hard. Okay, so Daveed ended up being not a thief, but an archer. He came out well and you can see the character sheet in the accompanying images. I continued to test character generation with my family. This is kind of important, because they will end up playing in my first game. The process was just as smooth with them and they ended up with some interesting characters, My youngest ended up with a pretty powerful Nordic barbarian. My wife ended up with a Zamorian scholar, merchant, and sorcerer. My eldest got a weird cross between a thief and merchant. My son is still working on his character. One thing I found interesting was how common the Animal Handling skill was. 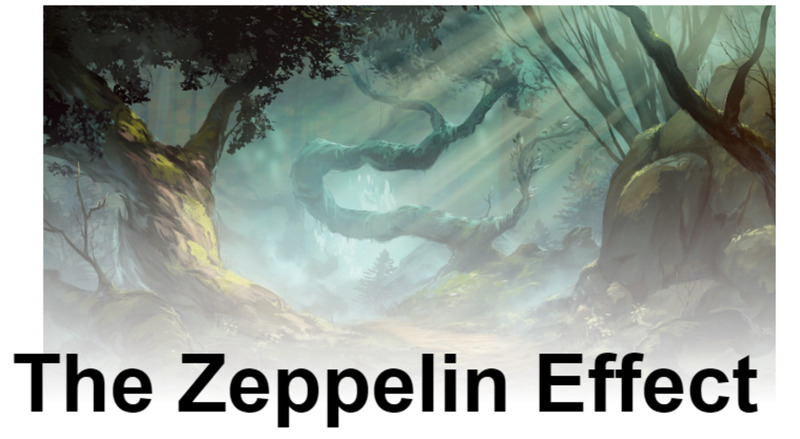 I asked the Modiphius community organization, Lloyd, about this. He gave me the answer I expected. Imagine you were living in America and didn't know how to drive a car. Okay, that's all well and good, but characters are coming up with Animal Handling 2 - 3 on average with 1 or 2 in all other skills. Maybe it's just the way we're rolling. I don't know, though. Another comment is you'll see the character sheet I posted above. 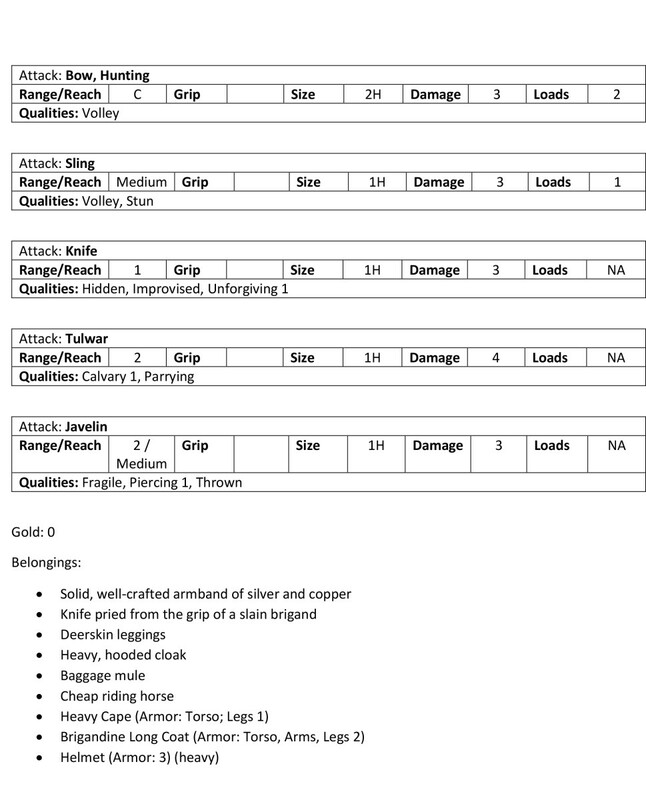 The Modiphius character sheet for Conan is one of the most gorgeous character sheets I have ever seen. I think it's in second place, right after Numenera character sheets. The problem is: they are a bit too beautiful. There is a lot going on there and where some of the splatter is, it can make things difficult to read. They use up a lot of ink, too. 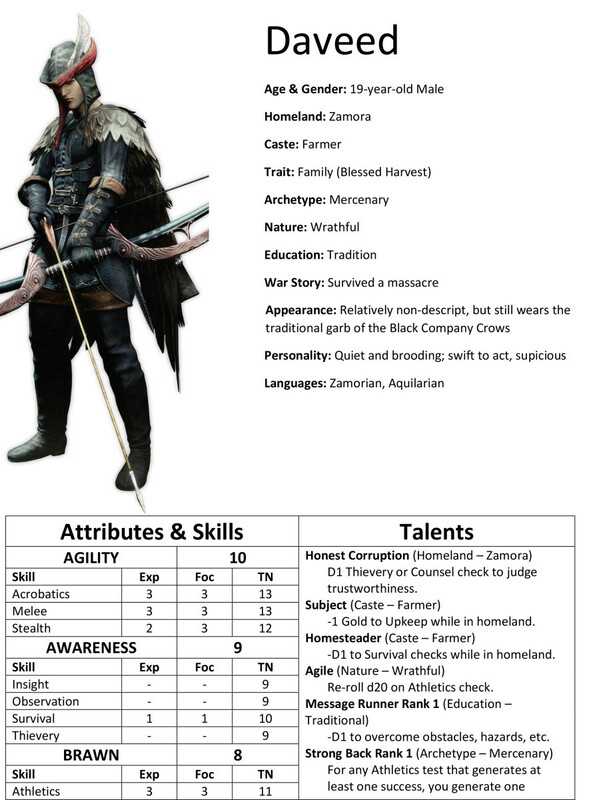 I have Daveed's character on an official character sheet, but I had to write small enough, the picture didn't look good enough for me to share on here. Help, They're Taking My Money! Man, Modiphius. I have to hand it to you. I am one stingy guy. I like to keep my money in my pocket. Meanwhile, you have me throwing it at you and you're going to keep getting more of it, it seems. There are already a number of supplemental books out for the Conan game: Conan the Thief, The Book of Skelos, The barbarian, The Mercenary. Each of these presents more option for the characters--archetypes, stories, etc. This is the one thing I definitely wanted more of in the core book and I'm glad to see more of it is coming out. Honestly, I can't wait to get my hands on them. There is a bit of a reason for that, which I'll go into after the following video by Lloyd about one of these books I just mention. Don't get me wrong: Conan is a great story. Or, I guess, several great stories. I am muddling my way through them. And this game is designed to allow you to share in those adventures, share that world. But, let's face it. I do not know this world. There are people who can recite chapter and verse of the Nemedian Chronicles. I am most certainly not one of them. I want to be able to bring the dark and gritty adventure to my family and friends, but I don't feel I can do Howard or Conan justice. I feel--and this is my personal malfunction--that my unfamiliarity with the subject is a bit of a detriment to the game and the story. Plus, how much would I get wrong? Of course, the old saying goes: make it your own. But, why not fully make it my own. I am going to start with the works I am reading and the books I still need to get, but I plan on making something wholly my own. Do I think I'm the next Robert E. Howard? Not in the least. But, I'd like to create something of my own that people can enjoy. Hopefully, I'll be chronicling those adventures of creating the world here on HubPages. So, stay tuned for that. Have You Tried Conan by Modiphius Yet? What Do You Think? I've been meaning to have a look, but haven't had a chance. I have the book and like it, but have not yet been able to play. I have the book, but don't like the game. This is an awesome game, what took the author so long to get on board? !